I’ve had extensive experience on television and radio, hosting the live weekly TV series, Petwatch, for BBC 1, presenting two series, Good Companions and London Walkies for Thames TV and People and Pets, a year long feature on Richard and Judy’s Good Morning for Granada TV. I’ve been a guest on programs such as Terry Wogan and Gloria Hunniford. I’ve written weekly and monthly columns for The Daily Telegraph and Today newspapers and for magazines Prima and Dogs Today. 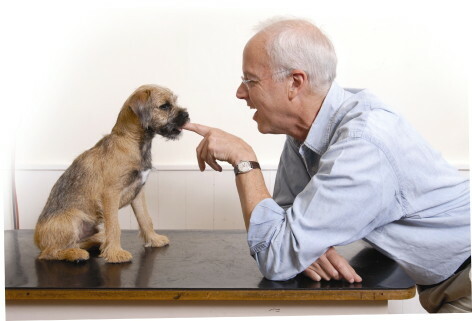 For over a decade I was the Resident Vet on The Jimmy Young Programme on BBC Radio 2. A few years ago, when my then dog Macy – the one I took on extensive travels through North America and Europe – died at six years of age, I tried to come to terms with how dreadful I felt by writing down my thoughts. This became a feature article in The Independent and the following day in The Daily Mail. Many pet owners subsequently contacted me to say how grateful they were for the thought that follow. Why do sensible, level-headed people find the death of a pet so hard to cope with? Recently bereaved vet Bruce Fogle reflects on the complicated, and often heartbreaking, relationship between a man and his best friend. I’m unanchored. Emotionally adrift. Not because my marriage has hit the skids, or because my children are unwell. I haven’t lost my job. I’m not even moving home. My mind’s in a stew for a banal, some of you might say a really trivial, reason: my dog died. It’s not that my dog was anything particularly special. She was a family dog, a six-year-old female golden retriever, one of the umpteen dogs you might see every day being exercised by their owners. But she was my dog, a warm, soft, beautiful, loving thing. Macy was a thoughtful creature, a considerate being, a trusting and worthy part of my family. She was my travelling companion, accompanying me on long travels we took together around North America and New Europe. There are some, and you may be one, who dislike the anthropomorphising of dogs: the humanising of their personalities, their feelings, their emotions. To me, there are shades of this. I hate seeing dogs in party hats or wearing antlers at Christmas. But can you seriously refuse to grant a dog the complexities of emotional feelings? Many do, but I can’t accept that. I can’t believe that dogs don’t have emotions and the only words I have to describe those emotions are ones I’d use to describe a fellow human. My dog Macy was “jealous” when another dog took one of her toys, “thoughtful” before trying anything unfamiliar, ” joyous” when she met people or other dogs she knew, “contented” to be left alone, “purposeful” when investigating the natural world around her, “circumspect” in her approach to unknown people, ” contained” in her display of emotions. Helen Mirren in The Queen reminded me of Macy – guarded, wary, restrained, but no less ” human” for it. But there’s a trickier emotion. Can you describe love? Can you put your own feeling of love for someone into precise words? Can you capture in a sentence or a paragraph that feeling of love so that someone reads and understands what you mean? Why do we love a species that so depends on us? We guide our kids from their early reliance on us to eventual independence, but the dog’s dependence is permanent and we love them deeply for it. An evolutionary biologist would say that’s the dog’s trump card – her ability to convince us that she needs us forever and ever. They thrive on our lifelong need to nurture. Macy did this in a number of ways. First, there was that look in her eyes. It was exactly the same as the look of love in my wife’s eyes. So why is it any different from the love Julia need not put into words? There’s another look she could get in her eyes – absolute, unmitigated, concentrated interest in me. An uncle of mine had that look and women generations younger than he fell in love with him because of it. So why can’t I fall in love with that look in my dog’s eyes, a look that told me she thought I was the most interesting and vital person she’d ever met? And silence. Is that not the true glue of love: the ability to be together, to do together, to understand each other without the need for words? The ability to feel love certainly predates language. Being with a dog, understanding her moods, her wants, her feelings, her emotions, without the need for words, returns you to the core of your being, to a time before words, when body language said everything. As so many dogs do, Macy bestowed unconditional devotion, an unquestioning reliability, a constancy and an immutability. Her intention was always to be there, to leaven anywhere with the familiarity of her presence. After the thrill of the chase, even when lost in the deepest woods, her purpose was always to return, to find me, to be rejoined once more. Of course, that’s at the core of the most sentimental stories about dogs. Every culture has them: the dog awaiting his master’s return, even from the dead. That’s unmitigated sentiment but, I ask you, what’s wrong with that? Can another human ever equal the unqualified, unconditional regard that a dog has for us? Living with a dog is an ongoing process of interpreting. We intuitively interpret what our dogs, with their bodies, tell us, and when we can’t fully interpret we take them to the vet so that he interprets what’s happening. As well as her owner, I was also Macy’s vet. I’m used to that triangular relationship, you, your dog and me, all interacting with each other. I usher dogs through life, from the faltering first steps of puppyhood, through the arc of life to the often pain-riddled last steps of stoic old age. I have a relationship with the dog and with her owner. To dogs, I provide medical care. To owners, I offer experience and advice. There are times when I have to cut myself loose from the emotional link I’ve made with my patient and speak dispassionately with her owner. “Are we doing such and such because it’s good for the dog or are we doing it because we can’t bear the emotional torment of the only alternative: to painlessly kill.” But when it’s my own dog that’s gravely ill, there’s no triad. Who do I talk to about her? Walking your dog is life-affirming and it’s probably what I miss most now that she’s no longer alive. It’s as if you’re plaited together, one extended consciousness, awareness overlapping. I see a squirrel before she does, and then she spies one before I do. On one of those walks, rather than charging ahead in front of me, Macy unexpectedly walked beside me. Dogs develop ritual behaviours and, because Macy had deviated from hers, there in the park I examined her and felt a mass the size of a chicken egg, fixed firm in her guts. I pretended to myself, and later to my wife Julia, that it was an ovarian cyst but knew that was unlikely. I took her to the clinic, withdrew a blood sample and found nothing unexpected but I knew I’d have to operate to see what the mass was. That night, in obvious distress, Macy came to Julia’s side of our bed and, with anxiety in her eyes, she panted relentlessly. I gave her a painkiller and she relaxed but it wasn’t until the following morning, when I operated on her, that I knew for certain that she had haemorrhaged in her abdomen. Once the blood was cleared away I found the site of her bleeding and removed it. There was other sites too, filled with cheesy material, like pus but not pus, and I removed most of them too. But not all of them. There were simply too many. When we finished operating, I still didn’t know the exact cause of her condition but experience told me that whatever it was, her life would be short and probably uncomfortable. I didn’t want to lose my dog but I didn’t want her to wake up either. I increased the narcotic painkiller and took her home to Julia. There, I continued to add painkiller to her intravenous drip and, lying by the sofa, conscious but asleep, by the light of the fire, she died that evening, not having had the distress of re-awakening. Just that week I’d received a book from an American publisher, hoping that I’d write a blurb for the back jacket. It was an intelligent and attractive tale, told by Ted Kerasote, a self-sufficient outdoorsman from Wyoming, of his life with a big yellow dog named Merle. Of course, every book about a dog tells the story of its end. Ted only had his empty house. I had Julia and, although we didn’t need words, we too dissolved. When dogs are members of the family, when we know they have feelings and emotions so similar to ours, when we grieve for their passing as we do for any other beings we have formed bonds with, we need rituals to help us cope with the end of a life. Julia and I stayed with her body for a while, my fingers buried in my dog’s hair for my comfort now rather than for hers, then I wrapped her in a sheet, put her on her bed in the back of the car and drove to Sussex. At dawn the next morning, I started digging under a low, bushy bay tree where on hot days she had silently retreated for shade. The clay was as hard as concrete but this was a satisfying ritual I’d carried out before. I’ve got two more dogs, Liberty and Lex, buried in their favourite spots in that garden. It’s a final service, a last “thank you” to an innocent. Rigor mortis had come and gone and as I carried her from the car to the hole I’d dug, her head lolled like a flower on an old stem. Mock me if you must, but I buried with her all the lost tennis balls that she’d found in the park during the previous month and proudly carried back to the car, 11 of them. Dogs can’t tell their life stories, but sentimentally, and I dare say tediously, we dog owners tend to narrate our dogs’ lives to others. To those who have not formed an emotional bond with an individual dog, a description of the quiet intimacies in that relationship can be discomfiting. To those of you who have, let me say this, both from my own experience and from watching so many others endure the grief of losing a dog. What differentiates the loss of a dog from the loss of a fellow human is the fact that the core values in our affiliation with dogs can be re-formed. The emotional value of living in the company of a dog does not reside solely and uniquely within that one individual. A dog dies and that particular dog is irreplaceable, but the value of “dog” can be filled by others. Macy was the fourth dog we’ve had during our marriage, and certainly the most travelled. I’ve surprised myself by how cut up I still feel about her premature death. Maybe that’s because she died young, or because I spent so many months on the road, travelling alone with her, sharing experiences with her and no one else. Or maybe it’s because she was my first “digital dog “. It seems that every time my screen saver comes on there’s another random picture of Macy, among lingonberrys on the Russian border, ploughing through the surf of an empty Oregon beach, at Florian’s café in Venice. The memories remain, but I know too that, inevitably and joyously, she will soon be followed by a fifth.